Drive Disney•Pixar’s Lightning McQueen into Smokey’s Garage. After a tough training session with Junior Moon and Smokey, it looks like he’s going to need a little repair work! Change the tires and then make sure to pick the right tools to tune Lightning's engine so he's ready to win the next race! Price is 20% below the initial Lego retail price, a € 5.00 discount! This comes down to 17.23 cent per brick. The Smokey's Garage (10743) Lego set is no longer directly available from the sites below. However, 3rd party partners of these sites might still have the set available. Alternate description Fix Disney•Pixar’s Lightning McQueen for his next exciting race! 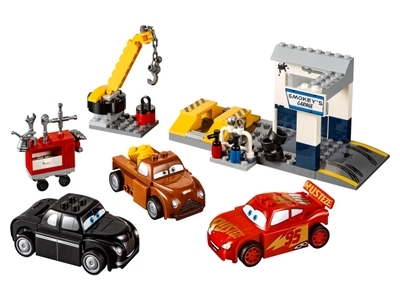 Includes Lightning McQueen with his Rust-eze 95 decoration, Smokey and Junior Moon characters from Disney•Pixar Cars. Features an Easy to Build garage set with a car ramp and yellow raised ramp, movable crane, wheeled tool kit cabinet and Smokey’s Garage sign. Drive Lightning McQueen onto the yellow ramp and get ready for an overhaul. Build and rebuild Lightning McQueen until he’s ready for the next racing competition! Accessory elements include 3 spare tires and assorted tools.